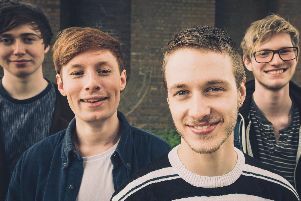 Twinfest is back this week with bands from Northampton’s twinned towns of Marburg in Germany and Poitiers in France joining local acts for gigs at across the town. The opening on Thursday, July 26, is at the Great Hall at the Guildhall in St Giles Street, with The Lamplighter, The Pomfret Arms, Club 43 and The Black Prince all hosting gigs on consecutive days through until Sunday, July 29. This year sees The Flims and Hyll travelling from Marburg and Mantras from Poitiers. Twinfest organiser Paul Brown said: “We’re very much looking forward to the return of Twinfest. Organisers were able to secure the use of the Great Hall for the first time after meeting former Northampton mayor Gareth Earls in Marburg in March. Mr Brown said: “Gareth was there for a visit for the 25-year celebration of our twinning. “We got chatting and I think it was a bit of a surprise to him to see the huge efforts put in to the combine festivals. Thursday’s opening night begins with Kieron Farrow at 7.30pm, followed by Hyll, Drinsipa, The Flims, Mantras, Sarpa Salpa and headliners The Barratts. On Friday night at the Lamplighter headliners Century City will be joined by Leo Robinson, The Flims, Hyll and Mantras. Saturday sees Twinfest move to The Pomfret Arms for an all-dayer which begins at 1pm. Headliners Deaf Trap will be joined by Deep Sea Mountains, Michael Kinder, Duncan Bisatt, Crybb, Kenneth J Nash, Straw Horses, The Flims, Hyll and Mantras. The same night, there will be an international jam hosted by The Barratts at Club 43. Twinfest’s final day at The Black Prince is another all-dayer with music again kicking off at 1pm. Headliners Monarchs will be joined by Mantras, Mio Flux, The Flims, Skirt, Hyll, Pieces, King Purple, The Keepers, Yodaclub and Tome Rose and the Heathen Orchestra. “Twinfest is very important to Northampton, especially for the artists we put on over the weekend,” explains Mr Brown. “This year especially, due to Umbrella Fair taking a break and because of the change of format for the last couple of years of the Northampton Music Festival which to me is a great shame. “There are some venues in this town who are doing some great nights of music and also brave promoters getting new music into this town alongside our local artists." This year 93 bands applied for 18 slots to be part of Twinfest, with planning starting six months ago. The Mano Festival in Marburg in March and Les Expressifs in Poitiers give the Twinfest organisers the chance to look at which visiting bands they would like to invite to be part of Twinfest. “The Mano Festival is on a much larger scale than Twinfest,” explains Mr Brown, “but it’s similar in that it is only a music festival and held in the evenings at venues around the town. “Marburg is a large university town and the festival is always well attended. “Les Expressifs in Poitiers is different as it’s not just music for the weekend. It’s a music and art festival where you can watch one punk band who will then be followed by ballet, a juggling act or a two-hour drama play. It covers many areas of the arts throughout the weekend. Explaining the importance of the annual festival to Northampton, Mr Brown said: “Twinfest gives the opportunity for artists to see other bands perform who they maybe wouldn’t go and watch. “Whatever genre or whatever you like, people should all sit together and share the love of music and show support for each in what they are all trying to achieve. Wristbands for Twinfest cost £6 and allow admission into all Twinfest shows. Admission into Friday and Saturday events is free with donations accepted. Admission on the Sunday is £5 for anyone without a weekend wristband.